Urban Golf: What Is It? 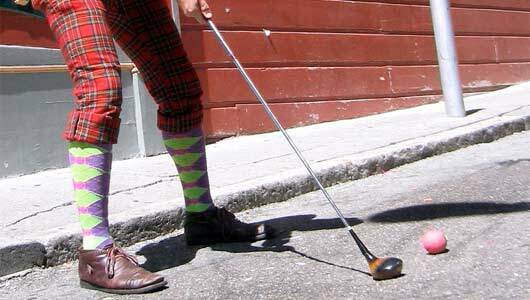 Urban golf (also known as cross golf, street golf or anarcho golf) is where players hit synthetic balls at improvised targets using a variety of clubs. There are no defined rules – each group defines the target(s) to aim for, the number of shots permitted and the game can be played in a variety of ways. Urban golf has been considered a “less uptight” form of the sport by its players, which usually consist of 20-somethings. The game can be played on synthetic grass, in the streets, in the city or even at a park. And while there are clearly similarities, unlike frisbee golf, urban golf usually features a distinct lack of nature, is played with balls and “clubs”, and includes a substantially higher frequency of big buildings. And, unlike either frisbee or traditional golf, hazards and bunkers typically take shape in the form of items such as drains and street furniture. Invented in the 1990s in Berlin, Germany, the game of urban golf has spread across Europe and into New Zealand, and is now gaining popularity in the United States. Has “urban golf” become a thing in your area? Let us know! And for those of you already familiar with the sport, there’s great news: our sister company, Odds On Promotions, can help you insure a promotion around urban golf! Just give them a call at 888-827-2249 for a free, no-obligation quote… or email them! To find out more information, also be sure to check out the Wikipedia article on urban golf. Home » Blog » Urban Golf: What Is It?